San Cristóbal de La Laguna on Tenerife was the first non-fortified Spanish colonial town, and its layout provided the model for many colonial towns in the Americas. It was founded between 1496 and 1497 by Alonso Fernández de Lugo and was the capital of the island after the conclusion of the conquest of the islands. Town (Villa de Abajo) of 1502. The area contains several churches, the Dominican Convent of Santa Catalina de Siena, and private residences. They date from the 16th - 20th century. La Laguna (as the city is commonly known) lies right beside Tenerife Norte Airport, and forms a single urban center with the island's capital Santa Cruz. It’s a sizeable city of 150,000 inhabitants, which became a WHS in 1999 mainly because of the model its urban layout provided for many Spanish colonial towns in the Americas. The Lower Town of La Laguna displays the checkerboard street plan that became the norm afterwards. I stayed in La Laguna for 2 nights at the final stage of my trip around Tenerife and La Gomera, and walked the city’s streets for some serious sightseeing on Saturday morning. Most historic buildings are private residences, usually with an elaborate front door or wooden balcony. 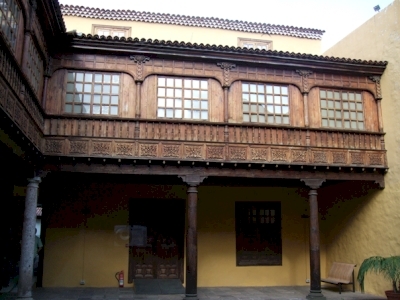 The Historical and Antropological Museum of Tenerife is housed in one of them, the Casa de Larcaro. Entering the museum gives you the rare opportunity to actually look inside one of these buildings – most of the other ones are closed to outsiders. The museum tells the story of the Conquest, the sugar industry and the Larcaro family. La Laguna has some good 20th century architecture too, such as the Palace of Rodriguez de Azero (now the Casino) and the Leal Theatre. 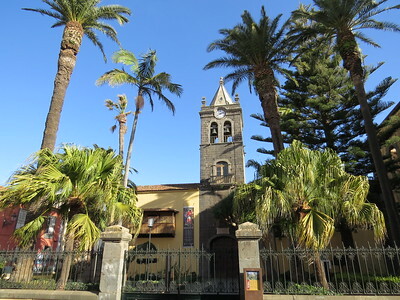 The most striking parts of La Laguna are its many churches and other religious institutions. Religious orders such as the Dominicans, Jesuits and Augustinians came here to convert the local population, just as they would do in Latin America. The finest church is La Concepcion. It’s by night that the historic city center really comes alive. The pedestrian streets are filled with cafés and small restaurants, offering mainly tapas and pinxtos. No All-day-English breakfasts here: this is a place where the Tenerifeans and other Spaniards go. I had no problem to amuse myself here, enjoying for example the Canarian comfort food Ropa Vieja. All things considered: this is not a WHS visit that will stay with me for long. The street plan wasn’t that obvious to me, and unfortunately the tower that could provide a good overview was closed. The nomination file records no less than 16 reasons why it should be inscribed, something that even annoyed ICOMOS. Having travelled around La Gomera and Tenerife for a week, I can see that the Canary Islands are considered a stepping stone to the colonization of the Americas. La Laguna might be the best preserved example of that. I did a half day trip to La Laguna during my January 2011 holidays in Tenerife, and I was not disappointed. The historical district was nicely repared, so I could admire colorful facades of townhouses with fine wooden decoration. What I liked the most were wooden balconies and pretty courtyards (photo). The late gothic main church was also interesting both form inside and outside. I think the place is worth-visiting once you are in Tenerife. This was our first World Heritage site on the Canary Islands, and proved to be quite interesting. It was one of Spain's first overseas colonies, and the city's layout was subsequently reused in many other colonies in the Americans including Havana, Cartagena and San Juan de Puerto Rico among others. Although there's plenty of modern buildings scattered around, we spent a nice afternoon wandering around and looking at the various buildings. The cathedral was especially interesting, along with the Church de la Concepcion with its tower. The House of the Captains-General was also quite impressive. On the whole, this is probably the least impressive of the three sites in Las Canarias, but well worth checking out on your way to Teide and Garajonay! 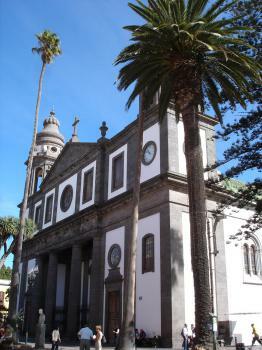 San Cristobal de la Laguna was the ancient capital of Tenerife and is still its cultural centre. Today, La Laguna and the modern capital Santa Cruz form a contiguous urban area. Certainly, there are numerous historical towns on the list that are more impressive, nevertheless I enjoyed strolling through the streets of the old town. The historic town centre is laid out like a chessboard. Colonial buildings from the 16th to 18th Century, beautiful churches, and small squares framed by palm trees dominate the scene. Where it is possible, one should have a look at the patios of the manorial houses. Many of them are abundantly planted and typical Canarian wooden balconies can be seen. Worth seeing is the Casa Montanez, the Teatro Leal from the early 20th Century, the Cathedral (photo), and the ex-Convento de San Agustín. Much of the old town was turned into pedestrian zones, so that it is pleasant to stroll through the narrow streets. You reach San Cristobal de La Laguna easily via the well developed motorway. The city is worth visiting if you are in Tenerife, and it is a nice contrast to the busy tourist centres in the south of the island. This is a small city near the town of Tenerife. It was declared World Heritage Site in 1999 as its historic buildings remain quite well kept after 500 years. Anyway it is not my favourite site in Spain. I respect the reasons that led the Committee to declare it but in my opinion there are several other places in my country that would have deserved the nomination previously to this one. I would not go till the island of Tenerife only to visit this town but the island itself has a lot of attractives, including another World Heritage Site, Teide National Park. Therefore if you decide to go there perhaps you will enjoy a walk on the streets of this old city. La Laguna is connected to Santa Cruz, the capital of Tenerife, by a tramway. A ride takes 35 minutes. Built in the 16th century: First founded in 1497 it "consists of two distinct parts .. the Upper Town (Villa de Arriba) of 1497 and the Lower Town (Villa de Abajo) of 1502 ... (The latter) based on a regular town plan based on Leonardo da Vinci's model for Imola..The Lower Town .. expanded rapidly, attracting the island�s ruling classes, and by 1515 had more than a thousand inhabitants�. Monastic communities started in early 16C..Official urban status was granted 1531. ..The town was set up ...as the organized space of a new peaceful social order inspired by the millennary religious concepts of the year 1500."